I first spoke with Bà Sáu in 2013. 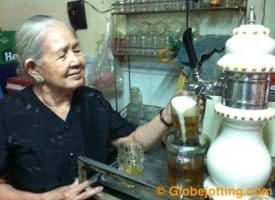 She had been a beer-slinging legend for years on Bùi Viện Street in Saigon’s backpacker quarter, running a hole-in-the-wall drink shop whose biggest draw was bia hoi, locally brewed draft beer that sold for even less than the already-cheap bottled Vietnamese beer. She was a no-nonsense businesswoman who, for more than a year, turned down my repeated interview requests. “I’m too busy,” she would tell me, turning away to insist that customers get up off of their wobbly, plastic chairs on the sidewalk and move to different seats to make room for a bigger crowd. “I don’t think she’ll talk to you,” my friend, Phúc, said one afternoon, after multiple failed attempts, as we sipped beers at another place across the road. On that afternoon in 2013, Phúc worked the same magic he has worked with several other unlikely interviewees for my forthcoming book about Bùi Viện Street. He convinced her to chat with us for ten minutes. Once we got started, she talked for an hour. Bà Sáu was born in 1930, into a life of poverty. “We had no food or clothes,” she said. Things grew particularly dire in 1944, she told us, because the Japanese army had destroyed local rice paddies to use the seed for fuel. Somewhere between 400,000 and two-million people are estimated to have died of starvation under the Japanese occupation of Vietnam. Once a dirt road lined with ramshackle houses, Bui Vien Street today sometimes feels like Vietnam’s answer to Oktoberfest. In 1945, control was wrested from Japan. South of the Seventeenth Parallel, France stepped in to administer South Vietnam. 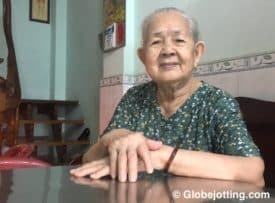 Then, in 1948, Bà Sáu said, her house was reduced to ash after her neighborhood was bombed. Her family fled to Phạm Ngũ Lão – a neighborhood that, decades later, would become the epicenter of Saigon’s backpacker party scene. Phạm Ngũ Lão Street, today a major thoroughfare, was a dirt road back then, according to Bà Sáu. Bùi Viện Street, which runs parallel to Phạm Ngũ Lão, was a narrow footpath strewn with small, wooden, thatched-roof houses. The area was a marshland, and the rainy-season downpours, which today turn Bùi Viện into a murky river that dissipates after an hour, would, in those days, create a sea of muddy goop with nowhere to drain. When South Vietnam came under American control in the 1960s, Bà Sáu’s life improved. But then, in 1968, a fire tore through the neighborhood’s wooden houses. Dozens of families became homeless. The US government offered funding to rebuild. Bùi Viện was widened into a proper dirt road. Concrete buildings replaced wooden houses. Housing in the years that followed was cheap, but with ten children to care for, Bà Sáu still struggled. My friend and translator, Tran Phúc hangs out on Bà Sáu’s patch of sidewalk. Her video rental shop switched to selling beer more than two decades ago, but the original sign remains. In 1990, she began renting a storefront at 102 Bùi Viện Street. She opened a video rental store. A faded green Fuji Film sign still hangs over the doorway. “There wasn’t much on television in those days,” she said. Neighbors flocked to her shop. But as more TV channels went on the air and programming choices improved, business dropped off. At the same time, however, a more significant change was happening. In the early 1990s, Vietnam opened its doors to independent travelers. By the middle of the decade, the country was welcoming more than a million-and-a-half visitors annually. 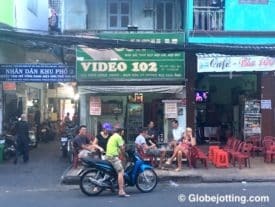 Its currency exchange rate made it an attractive destination to the shoestring-budget crowd, and Bùi Viện Street became their turf. Bà Sáu saw a new business opportunity. Young backpackers wanted, among other things, cheap beer. Bia hơi, locally brewed draft beer, was the cheapest beer available, and nobody else in the neighborhood was selling it. After growing up in poverty, inflicted largely by foreign military occupiers, Bà Sáu had identified a product and business model that would give her family a stable financial footing. Having always been fearful of and angry toward the uninvited outsiders who had decimated her world, she would now welcome a new wave of foreigners into her life. 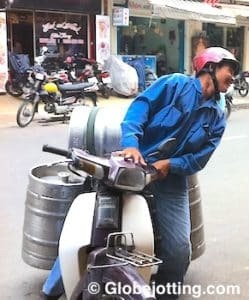 Kegs of “bia hơi,” a not-so-strong, easy-to-drink draft beer, arrive each day by motorbike. For many years, Bà Sáu had a de facto monopoly of sorts. On my first trip to Saigon in 2008, lots of bars in the neighborhood were selling cheap beer, but her place was different. It was the only shop onBùi Viện Street that sold bia hơi. It cost around 25 US cents per glass, 75 cents for a liter jug. It wasn’t particularly good beer but it was a unique slurp of Vietnamese culture. Crouching on undersized, flimsy chairs on the sidewalk was a quirky cultural adventure. By 2012, she had lots of competition. Shop after shop began emulating her business. Few offered authentic bia hơi, but they were touting bottled beer at rock-bottom prices. Meanwhile, property rates on the street skyrocketed. When she started out, her rent for the little room and its adjoining sidewalk was 75 dollars per month. In 2013, she was paying ten times that amount, yet still only charging 30 cents for a glass of beer. 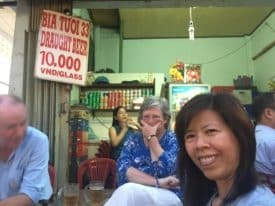 Bà Sáu’s daughters (one in the front on the right, the other in the background on the left) now run their mother’s friendly beer corner. 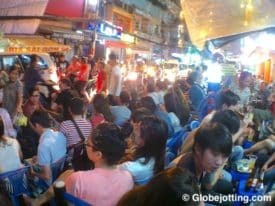 While the neighborhood is full of tourists, it has also become popular among young Vietnamese, eager to practice their English. I moved to Ho Chi Minh City in 2015 – to a neighborhood away from Bùi Viện Street’s chaos. On my first few visits to Bùi Viện after moving to Vietnam, I noticed Bà Sáu was never at her shop anymore. Her daughters were running it. I worried. Phúc and I went back recently to the beer stall at 102 Bùi Viện. I asked if Bà Sáu and I might have a short follow-up interview. Her daughter led Phúc and me to the family home in an alley around the corner. Bà Sáu’s cheeks looked droopier than before. At first she seemed tired, and she now spoke with a raspy tremor, but once we started chatting, she perked up. Bà Sáu in her living room in April, 2017. I asked about the recent wave of bigger, glitzier backpacker bars that have been taking over the street, buying out and consolidating multiple small storefronts. Were they threatening more humble businesses like hers? There is more competition today, she added. “Every house sells something” – not only on Bùi Viện Street, but also in the labyrinth of alleys that surrounds it. These alleys consisted of quiet, single-family homes on my first visit in 2008. They are now home to dozens of small hotels, two-table restaurants, massage parlors, and mini convenience stores. But where Bùi Viện Street is losing some of its character, its adjoining alleys have picked up the baton. They are changing, but they are still an authentic part of a rapidly changing Saigon – worth getting a little lost in. A labyrinth of alleys offers glimpses into family homes – but the alleys are changing fast, filling up with hole-in-the-wall restaurants, small hotels, massage parlors, and a scattering of plastic tables offering cheap food and beer to budget travelers. As we sat and chatted, Bà Sáu’s son-in-law passed through the living room. Phúc explained they were now running a small restaurant out of the family kitchen. 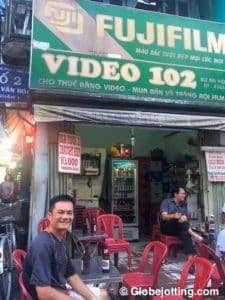 Bà Sáu’s son-in-law wanders Bùi Viện Street each night from 6 p.m. to 5 a.m., offering a menu to beer-swilling tourists at the long string of plastic-chair, sidewalk bars. If someone orders a snack, he dashes home to the alley, cooks up the food, and brings it to their table. Our interview finished, I thanked Bà Sáu for her time and got up to leave. “She says you should come visit her more often,” Phúc translated. I switched from English into my fledgling Vietnamese. I apologized for not speaking it better. I promised to keep studying so we could talk more, and to come visit again soon. This 87-year-old woman, who had once seemed hard-nosed and money-driven, who had refused for more than a year four years ago to give me even a few minutes of her time, now wanted to be my pal. Bà Sáu is one of hundreds of fascinating characters who occupy Bùi Viện Street. She is one of millions of fascinating characters who do business in tourist “ghettos” around the world. As travelers, we tend to talk with these people only if we wish to engage in a business transaction. If we put in the effort to ask them about their lives, we come away with far bigger experiences than any museum, monument, or scripted tour can ever offer.